Promotions for Singles Day 2019—all in one place! 11/11 Singles Day is coming and Picodi collects all the best coupons and deals here! What’s Singles’ Day all about? It all started with a few students from Nanjing University who decided to break away from the monotony of being single for one day. They chose 11.11 because of the solitary implications of the number 1 which symbolize being single. However, this simple celebration turned into one of the largest shopping days in the world. It turns out that this event gained great interest also in Southeast Asia. According to Google, in Philippines the popularity of Singles’ Day has increased more than four times in the last five years. Who’s taking part in Singles’ Day? What are the behaviours of consumers on that day? To look further into this phenomenon, we analysed historical data and surveyed people from Philippines. The results are presented in this report. So, who exactly takes part in Singles’ Day? The survey suggests that more than half of the participants are women—57%. In accordance with the event’s name, three out of four consumers are single. Of course, not only singles went on a shopping spree. An increase in interest, although not as significant as among singles, was also noted in the group of people in relationships. 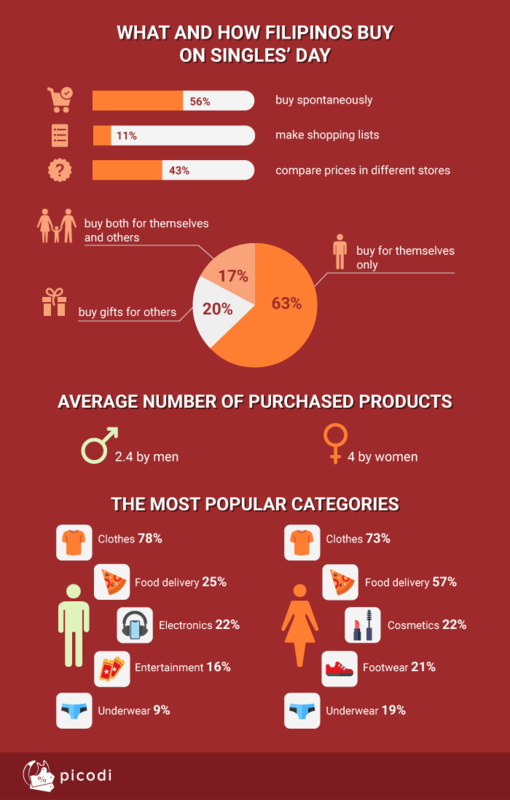 The interest in Singles’ Day is especially apparent among young Filipinos. Compared to a regular day, the number of transactions on Singles’ Day among people aged 18-24 grew by 1022%. However, getting great discounts is not restricted to younger people—there was a noticeable interest in this shopping festival among all age groups. The results of the survey show that more than half of Filipinos do not prepare for the Singles’ Day shopping craze but buy impulsively on that day. 43% compare the prices in different stores and only 11% declare that they make lists before shopping. It looks like most people treat 11.11 as an occasion to meet their desires rather than an opportunity to execute a well-thought-out shopping plan. On top of that, most of the consumers—more than 60%—declare that they buy things just for themselves. Only one-third of the respondents also buy gifts for other people on that day. It appears that—as the name of the event suggests—Singles’ Day is a perfect day for getting a present for yourself. An average man buys less than an average woman—2.4 and 4 products respectively. The most desirable items among men are clothes, delivery food and electronics. Similarly, women buy mostly clothes, delivery food and cosmetics. 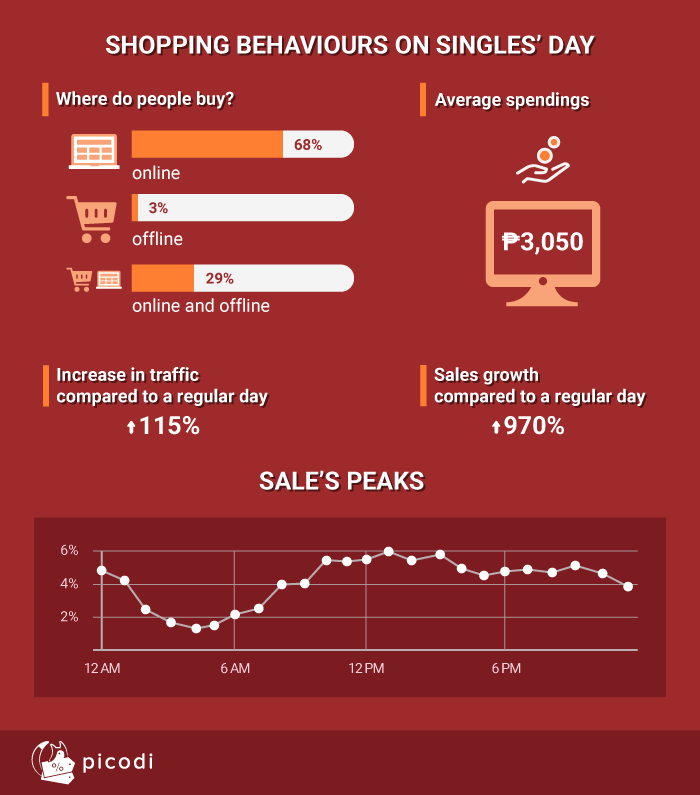 It’s not surprising that Filipinos buy more than usual on Singles’ Day. According to our platform’s statistics, the number of online transactions increased significantly—there were 970% more purchases compared to a regular day. A survey indicates that an average Filipino is willing to spend 3050 PHP on a Singles’ Day shopping spree. The sales reached a peak right in the middle of the day, at 1 PM. 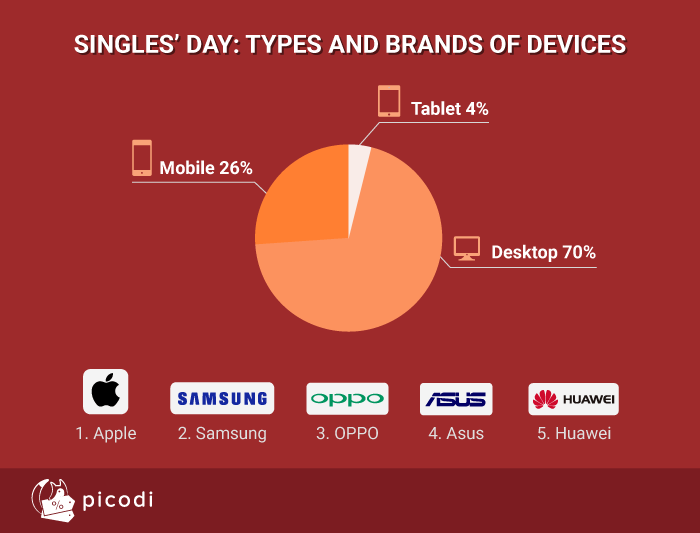 Majority of the consumers—70%—use desktops when doing their shopping on Singles’ Day. Only 26% of Filipinos make their purchases on mobile phones. Most of the transactions are made on Apple devices, followed by Samsung, OPPO, Asus and Huawei appliances. This report was created based on internal data provided by Picodi.com, a global discount provider existing since 2010. 600 participants from Philippines took part in the survey. 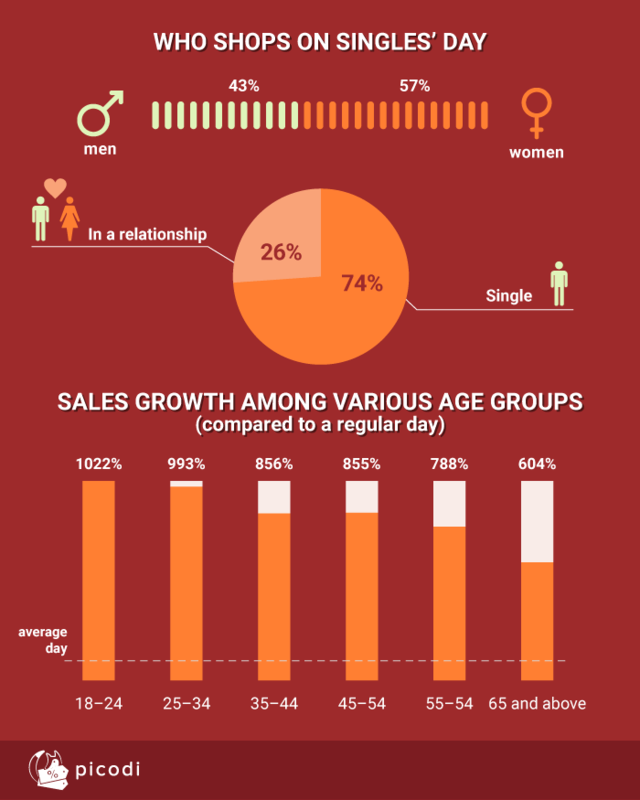 Are you willing to share our statistics about Singles’ Day with your readers? Feel free to use all the data and infographics for both commercial and non-commercial purposes as long as you indicate the author of the research (Picodi.com) with a link to this subpage.